So hopefully, if you have been reading my entries, it has been established that I love to cook and I love to eat. I have always been passionate about nutritious and healthy eating and cooking, both because of my ethnic background and my professional interest in preventive medicine and nutrition. For as long as I can remember, a well balanced, healthy diet was strongly emphasized in my family. I was taught to be very selective about the ingredients that I consumed, because in the end, they become part of your body and who you are. I carried this “food culture” with me when I left home, and found that there was nothing more peaceful or rewarding than creating a healthy meal with fresh ingredients and enjoying it with friends and family. As I discussed in my previous entry “Sure, I’ll have some cake with my cookies please!” preventive medicine, specifically with respect to nutrition, should be a critical component of medical training since we focus so much of our effort and energy in this area when educating our patients. That being said, I would like to talk about the Mediterranean Diet, which I extensively researched during my medical residency training and which I consider to be a nutritional role model for healthy eating. My investigation ultimately led to both a Grand Medical Conference for my Department of Internal Medicine in New York City as well as at the United States Air Force Base Department of Endocrinology in San Antonio, Texas. Specifically, I was interested in the Mediterranean Diet's impact on longevity, chronic disease prevention and deconstructing the specific elements. This topic is much too long to address in its entirety in one entry, so today I decided to touch on the history of the traditional Mediterranean Diet. I am a huge advocate of this diet and not just because this dietary lifestyle is delicious, but also because it is healthy, and the evidence proves it! You will notice that when cooking, I tap into all food groups such as vegetables, whole grains, fruits, meats and fish for a nice healthy balance and in the process I make use of one of my best friends, olive oil. The traditional Mediterranean Diet is a dietary lifestyle inspired by the people of the Southern Mediterranean region, specifically Greece, Crete and Southern Italy around the1960s. It was in these regions and during this time period that chronic disease rates were lowest and adult life expectancy was highest in the setting of limited medical services. The Mediterranean region depended heavily on agriculture. Hence, the diets of the people of this region were abundant in vegetables and fruit. In addition, the climate of this area allowed for the flourishing of vineyards, which is why the moderate consumption of wine (specifically red wine) was and is such an essential feature of the diet…exciting news if you love a good glass of Pinot Noir as much as I do! And finally, the Mediterranean region is an ideal environment for the abundant growth of olives, the main fat source in this diet. Also very exciting for all you salad and bread eaters, meat and fish marinaters, veggie sautéers …you get the point…out there! So when you hear people talking about the traditional Mediterranean Diet, they are referring the foods and drinks traditionally consumed by people living in the countries bordering the Mediterranean Sea. So what foods comprise the Mediterranean Diet? Below, you see a pyramid that depicts the traditional foods and drinks that make up this healthy, balanced diet (and sadly, no. Doritos are not one of them). 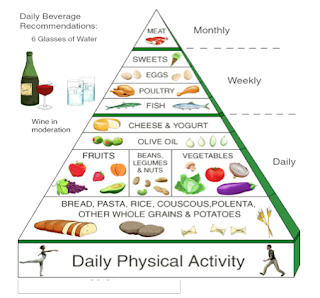 While it contains many of the foods you will find in other dietary pyramids, the principal difference is in the frequency with which some foods are eaten. While it’s true that almost all foods can be part of a balanced and healthy diet, your overall wellness (both dietary and medical) can be greatly affected by how often you eat different foods, and the portion size you choose. Just to highlight, there are 9 major components of the Mediterranean Diet that are emphasized in the major studies out there in the research literature. These are: high olive oil consumption, legumes, cereals, fruits, vegetables, moderate consumption of dairy products especially as cheese and yogurt, low consumption of meat and meat products and moderate wine consumption. And that brings me to Professor Ansel Keys, an American scientist who studied the influence of diet on health. In 1958 he launched the famous Seven Countries Study (http://jama.ama-assn.org/content/245/5/511). He had been studying diet, lifestyle, and incidence of coronary heart disease among over 12000 middle-aged men randomly chosen from seven countries, for over ten years. The results of his extensive research showed that in Greece, Japan and southern Italy where fruits, vegetables, grains, beans and fish were a major part of the diet, heart disease was rare. Whereas in the United States and Finland where people consumed red meat, cheese and other foods high in saturated fat in abundance, the rate of heart disease was found to be high. Of course, there were other factors involved as well. Professor Keys observed marked physical activity, strong family ties and a leisurely pace of life in the Mediterranean and Asian people. He therefore concluded that it was a combination of dietary and lifestyle factors that were responsible for the overall better health and lower rates of heart disease in these regions. In doing my research, I found it interesting to note that in the Seven Countries Study, the individuals living on the island of Crete consumed up to 40% of their calories from fat, however they had the highest life expectancy on average as well as the lowest rates of heart disease (this is along with Japan). But brilliant Professor Keys found that this was because the bulk of the fat in the Cretan diet was from fish and olive oil, rich in unsaturated fats (unlike the American and Finnish diets, high in saturated fats). He proceeded then to further conclude that although saturated fats can be harmful to your health, unsaturated fats could prove to have positive health benefits. What a breakthrough! I am going to stop here and continue on with this topic at a later date, as there is so much more to say. My concern is that if I keep going now, it will just be too much information to digest at once. No pun intended. Thank you! The recipes look delicious too!